It is possible to share views and reports with people who don’t have a Targetprocess login. Sharing is in read-only mode. All data can be viewed but cannot be modified. Full access is provided to users with active Targetprocess account only. Access settings for internal users are managed separately. More information: Private, shared and public views. Manage access permissions. This is not a built-in feature in Targetprocess. Instead, it is an extension called "mashup". Targetprocess On-Demand customers have it enabled by default; there is no need to activate it manually. In order to get it for an On-Site plan, install the "Share view" mashup manually. Copy the public link to the view and send it to your colleagues, stakeholders, or customers who don't have a Targetprocess login. External users can click on cards on shared views to open a pop-up with entity details. The pop-up displays only basic details: title, assigned users, current entity state, tags, description, attachments and comments. Description area includes embedded images. Files uploaded to an entity can be downloaded within Share View feature. The view's settings inside Targetprocess will determine the look of the shared view. 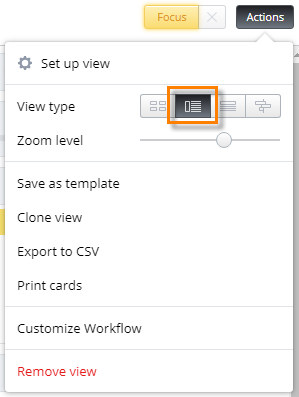 For example: if you have M-size cards selected with the To-Do column collapsed, the same will be shown in your shared view. Card details can be customized using the Customize Cards feature. The shared view will also use any currently active Visual Encoding rules. Shared views capture live data updates with 5-15 minutes delay. Changes of Project and Team selection in origin view made by the user who shared it affect the shared view as well. When you share a view, it will automatically be added to your list of public views. In order to manage the views you have already shared, click on the 'Manage your public views' link. You will see all the views you have shared outside of Targetprocess. Other Targetprocess users will not see your list of shared views. Each user's list of public views list will only display the views they have shared. When you remove a link from this list, the view will no longer be accessible for external users. For security reasons, we strongly recommend removing links to your shared views when the view no longer needs to be accessible. In 'One by one' views the link is always missing. This mode is not supported so far. If 'Share' link is missing for your view of other type, it could be related by temporary disabled mashups. Please check URL address of the view in your web browser. It should not have 'nomashups' parameter. It is expected. Up to 5-10 minutes delays are possible. On Board views, only the first 25 cards per cell are always displayed. On List views, only the first 100 items are displayed. The 'Load more' button is not supported. There is also no visual indicator that the cell has additional hidden cards. This limitation is known. More on it: Shared view shows less cards then there are in the cell actually. A link to your shared view is provided by our tauboard.com web server and can be accessed by any user who knows the exact direct link, without the need to enter in a password. List views only show the exact state of your expanded/collapsed hierarchical list. That is, external users can’t expand or collapse any of the given items in the list. There is also no “Show more” button available. A shared Timeline view shows the content within the local time-range (selected with the navigator at the bottom of the Timeline view in Targetprocess). External users cannot submit comments when they browse shared views. It is not possible to customize what fields are shown in the detailed popups. Shared graphical reports do not show the hints that you would normally get by moving your mouse over a value in the graphical report.